Infinity is built around the Infinity core. 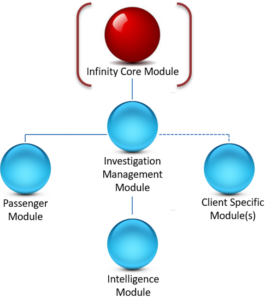 To ensure the highest level of security and to avoid necessitating users connect to the various servers directly, the Infinity Core Module acts as a proxy (API Gateway) in front of the cluster and hides all the complexity of the network hierarchy. Due to the distributed nature of the solution, the Infinity Core Module holds the centralised authentication and user management service also. This service is responsible for managing the user accounts and implementing single sign-on across the services.